Do you have a creative spirit? Are you an aspiring journalist? Why not join our writing team?! Youth Centres Canada is looking for youth writers to join our writing team! We give credit for all work you provide and also sign off on volunteer hours for your work. As a part of our writing team, you will write an article (between 500 – 1500 words) for our magazines that release at least twice a year. There may also be other opportunities to write! We will work closely with you to make sure you’re proud of the work you produce. Being on our writing team will certainly spice up your resume! Fill out the form below to apply to our writing team. 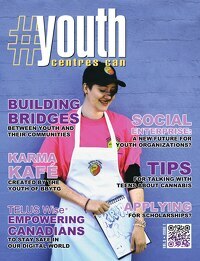 If you have any questions or concerns email magazine@youthcentrescanada.com! Fill out this form to apply to our writing team!